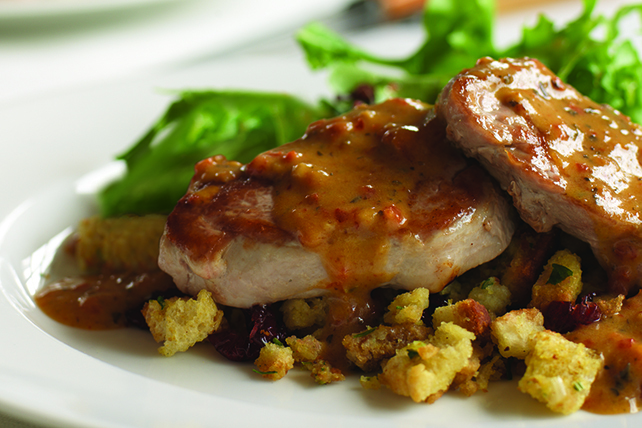 This recipe for Pork Medallions with Cranberry Stuffing is a keeper: a company's-coming dish that's actually weeknight-quick to make. Cut each tenderloin crosswise into 6 slices; pound to 1/2-inch thickness. Cook in large skillet sprayed with cooking spray on medium-high heat 3 min. on each side or until browned on both sides. Mix dressing and mustard; pour over meat. Cook on low heat 3 min. on each side or until meat is done and sauce is thickened. Meanwhile, prepare stuffing as directed on package, but reducing spread to 1 Tbsp. and adding cranberries to water along with stuffing mix. Spoon stuffing onto serving plates. Add meat; top with sauce.